The Davenport Station site is for users of Davenport railway station, Stockport, England - and for all the people of Davenport. 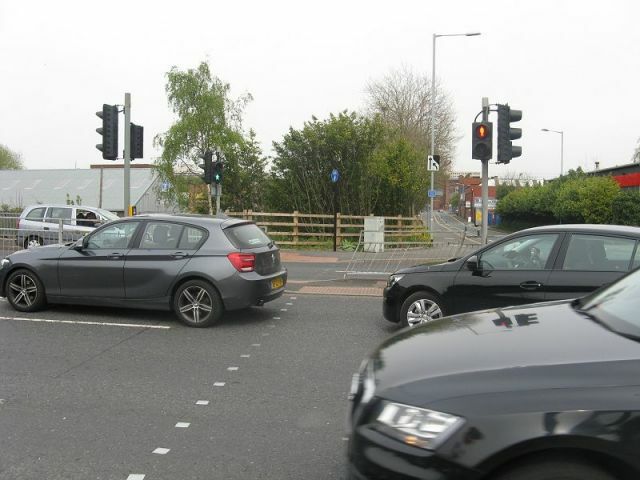 These supplementary cyclist's pages are for everyone who enjoy cycling around the south Stockport area, and especially those who attend the Stockport Council Cycle User Group meetings, which are freely open to all. New faces are always welcome. Note: this is a strictly unofficial site, not connected with or approved by Stockport Council or Northern Rail. Created and compiled by Charlie Hulme. Trans-Pennine Trail users from the west keen to visit Stockport Town Centre can now use the whole of the path from Didsbury alongside the river, cross the pedestrianised old bridge and emerge at the Old Woolpack Inn before travel along Chestergate using some new dedicated facilities which have been installed. However, there is an obstacle to cross in the shape of a very busy dual carriageway, as indicated by the sign shown here (which does not mention the town centre). Unfortunately the crossing is not currently a 'Toucan' one and has to be crossed in two stages, with a small-ish central refuge, just about big enough for two bikes, and perhaps not the safest place to be if the bent barrier is anything to go by. Note that the 'red-green men' do not work together. 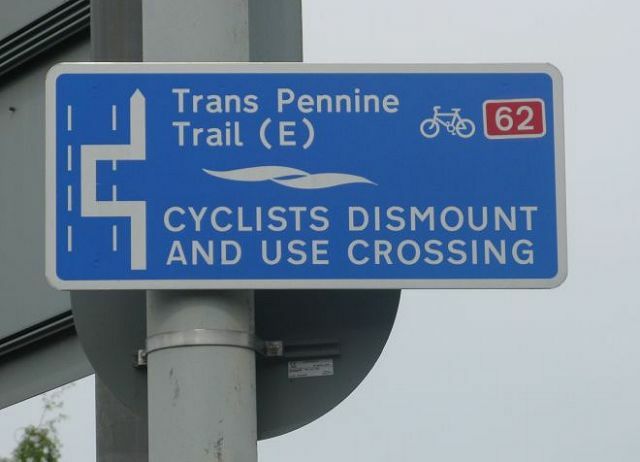 Once safely across, cyclists find an unusual choice of options. You can use the wide shared path - which is actually for use in either direction - or choose the one-way cycle lane on the one-way carriageway which tries hard to protect you, at least to start with, with bollards and new-fangled 'armadillo' devices. The shared path, on the other hand, features an entrance from the left with no priority for cyclists, and a bus stop with attendant litter bin. Notice how the cycle lane narrows to pass the bollards but the vehicle lane doesn't. In the distance, at and beyond the next junction, things get more tricky because planned developments for a second phase await the future (2018?) development of a new bus station, so there is still a messy right turn uphill and left round the back of the bus station into Mersey Square. 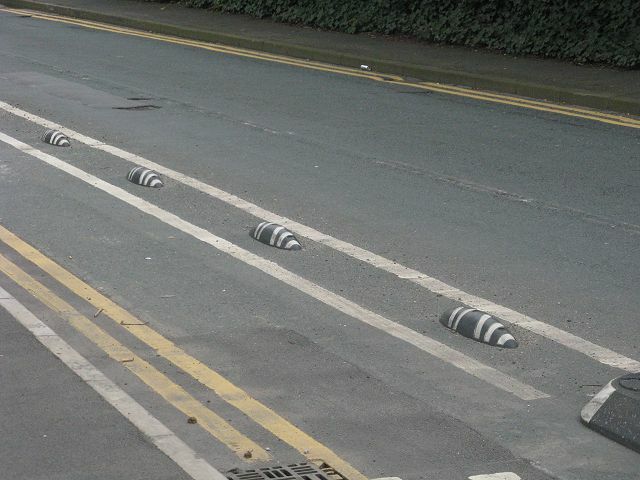 This is the first application in Stockport of the 'armadillo' which is supposedly designed to mark a mandatory boundary without creating damage if a car or lorry does hit it. 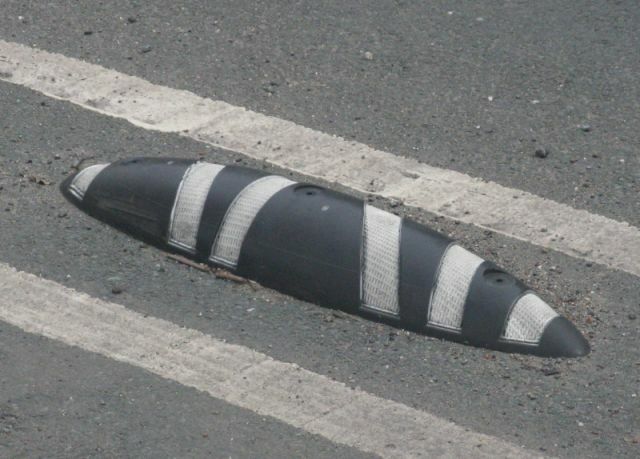 However, these are nor clever rubbery things like the famous 'cats eyes' but are a hard plastic, which experience with Greater Manchester's first application, in Salford, shows can break up if hit by a vehicle. 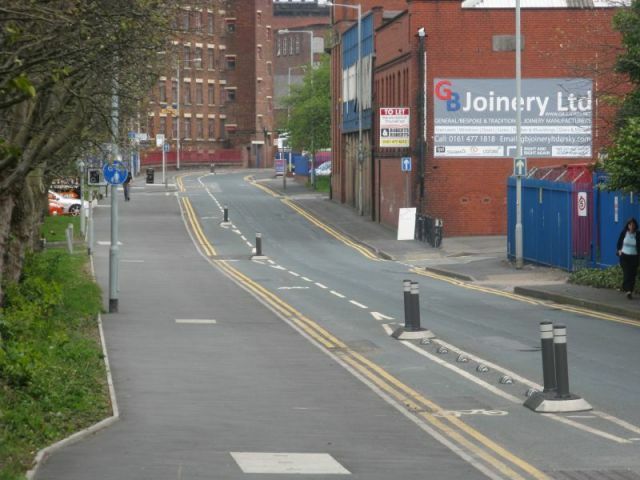 See the Mad Cycle Lanes of Manchester blog for more on this subject.